The International Monetary Fund (IMF) recently released its World Economic Outlook, October 2018, with estimated global trade tension scenario impacts on GDP. Overall, the IMF states that recent tariffs will hurt GDP and that additional tariffs will weaken it further. 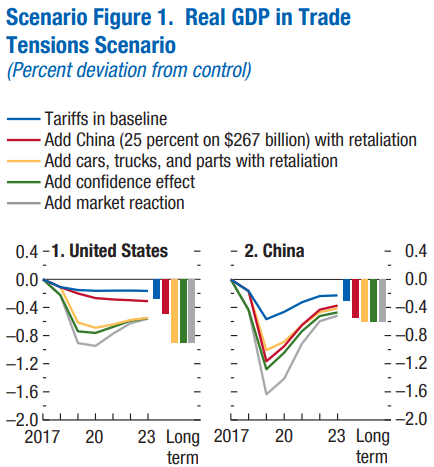 In the long term, according to the IMF’s scenario analysis (on p. 21,) the U.S. GDP will be 0.9% lower and China’s GDP will be 0.6% lower as a result from the trade tensions. However, in 2019, the disruption caused by an escalation of trade restrictions could be particularly large with GDP losses of more than 0.9% in the U.S. and over 1.6% in China. Based on the IMF estimates and the historical sensitivity of stock markets to GDP growth, if the trade tensions escalate, some countries may be impacted more than others. 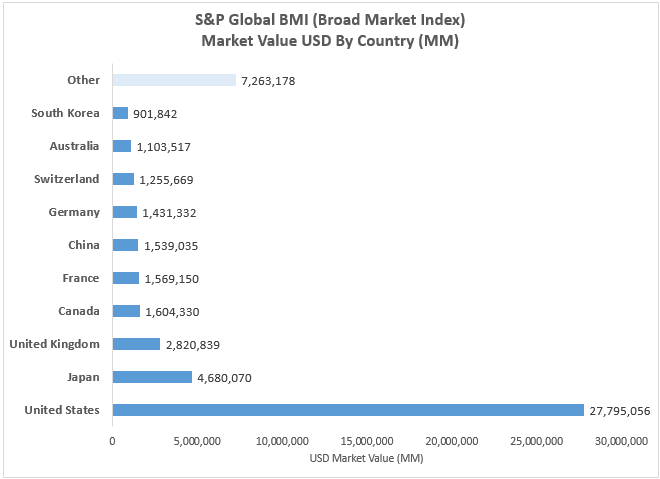 This can be measured globally by starting with the total U.S. dollar market capitalization of the S&P Global BMI (Broad Market Index) by country. The United States is the largest in the world, representing 53.5% of the total market cap worth $27.8 trillion as of Oct. 11, 2018. South Korea is the smallest country of the top ten by size, and has an index weight of 1.7% that includes about $902 billion. In total, the top ten biggest countries by market value include 86% of the world’s $52 trillion total market value. Source: S&P Dow Jones Indices Data as of Oct. 11, 2018. Next the historical sensitivities of each country’s stock market to GDP growth is measured. For example, for every 1% of U.S. GDP growth, the U.S. stock market value increased 3.79% on average (using year over year data from 1993-2017.) South Korea was most sensitive with a 9.35% stock market value increase on average per 1% of U.S. GDP growth, while Japan was least sensitive on average gaining just over 2% on average per 1% of U.S. GDP growth. The greater the percentage of its output a country exports to the U.S., the bigger the influence U.S. GDP growth has on that country’s stock market since the U.S. growth is so heavily driven by consumer spending. 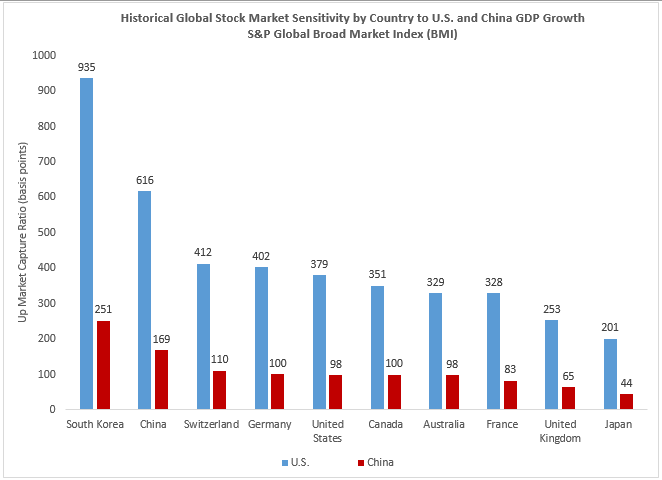 Overall, the stock market sensitivity was far greater to U.S. GDP growth than to China’s. Source: S&P Dow Jones Indices. Data is year-over-year from 1993-2017 for all countries, except is from 1998 for South Korea and China, as well as the composites. The chart shows historical market capitalization change per each 1% of GDP growth. After measuring the historical stock market sensitivity of the ten biggest countries in the S&P Global BMI to each U.S. and China GDP growth, the decreased GDP as estimated by the IMF can be applied as one possible scenario to understand how stock market values may be reduced. In total, if the U.S. and China GDP were to drop in 2019 by 0.9% and 1.6%, respectively (as estimated in a five-layer simulation by the IMF,) the global stock market value may lose $2.17 trillion or 4.9% of its value from the top ten countries under this scenario. A total market value loss of about $1.49 trillion and $687 billion, all else equal, may be attributed to the GDP reduction in the U.S. and China, respectively, in this case. While the total dollar market value loss in the U.S. would be biggest with a magnitude of $1.39 trillion under this scenario, the greatest percentage declines in market value might impact South Korea and China more with respective 12.4% and 8.2% losses.